Check out this new card game that combines some of your favorite games into one. 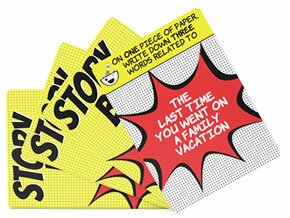 Story Bowl is a fun card game where players write down a three word story based from prompt cards. All stories then get put into the "story bowl" and the game begins. Depending on which round it is, clue givers try to have their team guess the correct words for each story by either explaining it (without saying any of the words), acting it out or only giving one verbal clue. You'll be laughing and smiling as you play this fairly competitive social game. You'll definitely want to know the whole story to some of the cards that get written. Three words are just not enough to give all the details but enough to get people intrigued. Give Story Bowl a try at your next party or get together and you'll be glad you did. Click here and use coupon code 3CUEHN2X for 15% off Story Bowl now until Oct 17, 2017.
Review Completed (2017-09-26) Brevity is key in Story Bowl and by that we mean you get three words to describe a story or event. Once stories are written, players then perform different actions to try and guess the words written for each story in the story bowl. After a quick read through the game rules that come as two of the included cards, we were off and playing. It took us about 30 minutes to complete the whole game and we had a blast playing it. We liked how the clues you were trying to guess had a real meaning to someone playing the game. After the game, we picked out the most random seeming or more interesting story cards and asked what the real story behind it was. So not only is Story Bowl a fun party game, it's a great way to learn some fun and interesting facts about your friends or those playing. Something to keep in mind is this game only comes with the cards. You'll need to provide a "story bowl," a timer, pencils and paper. Perhaps not a big deal for some but scrambling trying to gather together half of the game on our own was a little disappointing but not a huge challenge. The game is nice and portable as is but there are some extra components you'll need to gather on your own. We also found the scoring cards to be a little strange but worked ok as long as the top card didn't move. At the end of the game rules, there are some suggestions for additional rounds. We didn't play any of them but can see how this would add some interesting twists to the game. Some include posing like a statue, flamingo charades and using a human marionette. 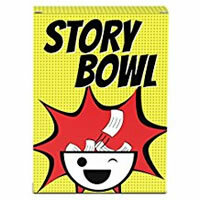 Story Bowl is a blast to play and will be different every time you play. We recommend it if you want a fun guessing, acting and get to know you party game. Who knew you could describe a whole story with just three words! The team that has guessed the most micro-stories after round three wins. You get 54 cards and the official Story Bowl game rules and instructions. Please keep in mind that the official Story Bowl party rules and instructions could be different depending on the game version you have. The rules below are some of the exact directions on how to play Story Bowl. Share with us your comments, funny stories, tips, advice, strategies, creative ways to play, questions about how to play, problems with the rules or anything you want about Story Bowl. All submissions will be reviewed within 24 hours. Click here to add your Story Bowl comments.